Tucked out of sight away from the throngs of commuters walking from Piccadilly Station is a colourful mural on Ducie Street, recently commissioned by the organisation With One Voice for their International Arts and Homelessness Festival and Summit, which will take place from the 12th until the 18th of November here in Manchester. 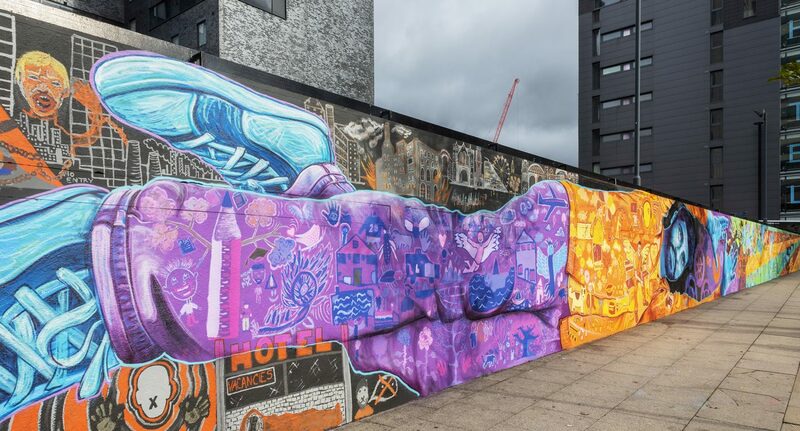 The mural was created by New York artist Joel Bergner with the help of 33 artist who are or have been homeless, and sets the tone for an event which seeks to start a positive conversation about homelessness by uniting arts with discussion. I had the opportunity to speak with Lora Krasteva, who is one of the International Producers of the festival about the With One Voice organisation and what to expect from the event. With One Voice is more than just a charity, it’s a worldwide movement promoting the combination of arts and homelessness, “[it was] founded by Streetwise Opera… [which was created by] Mark Peacock in 2002…[and] works with people who have been homeless in England. [It was founded on the] belief that… art elevates people. Art is a human right, everyone should be able to access that,” Lora explained. The seven day event is split between the Summit and the Festival, “[The] festival is a week-long, all events are free, some are produced by With Once Voice, others are put together by our partners… putting things out there”. Lora explained the difference between the Festival and the Summit, “the Summit is part of the festival, from Thursday to Sunday, on top of the regular programme, ticketed, in the style of a conference”. The festival is composed of events happening throughout the week, across the city in various locations, including Nexus Art Café in the Northern Quarter and the Manchester Art Gallery. The events range from photography exhibitions to performances. The Festival will be highly interactive, inviting people to be part of the discussion and is a city wide event. You can even look out for limited editions prints by the artist Mancy posted around the city. However, the events explore the serious side of the topic as well, “[its] Also for students who are socially and politically engaged, even showing up for the festival is already an act of support… You can pick and choose… the Saturday is an open day, so the centres will be opening their doors, and you can see how these spaces work so if you want to work in this sector [it’s a great opportunity]”. Tickets to the Festival are free, those for the Summit need to be bought in advance, however 50% of those tickets are free for people who are or have been homeless. You can find out more on their website.